Monarch Air Group provides private air charter in Daytona Beach, FL. Our clients benefit from top-notch service, unrelenting dedication to safety, wide selection of aircraft, and years of experience in chartering private jets. To obtain a free quote, please use our online quoting tool provided below, or call toll free 1-877-281-3051. Monarch Air Group provides private jet charter flights in and out of Daytona Beach, Florida. Being the world’s most popular beach, Daytona Beach has something more than just red sand. It is home to Bike Week in March, the Daytona 500NASCAR race, Spring Break for colleges, and Bike’Tober festival in October. Having hotel resorts and more than 10 miles of stunning beaches, Daytona Beach is the only site in the US, where you can drive on the people with people around you. The city boasts a vibrant nightlife, a great number of luxurious restaurants to eat and relax at, ocean center, a water park, aquarium, and more than five different spots to do watersports. 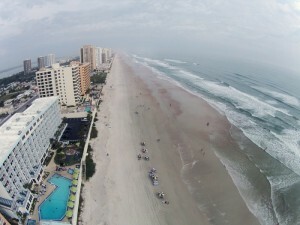 Daytona Beach is served by Daytona Beaches International Airport (KDAB).